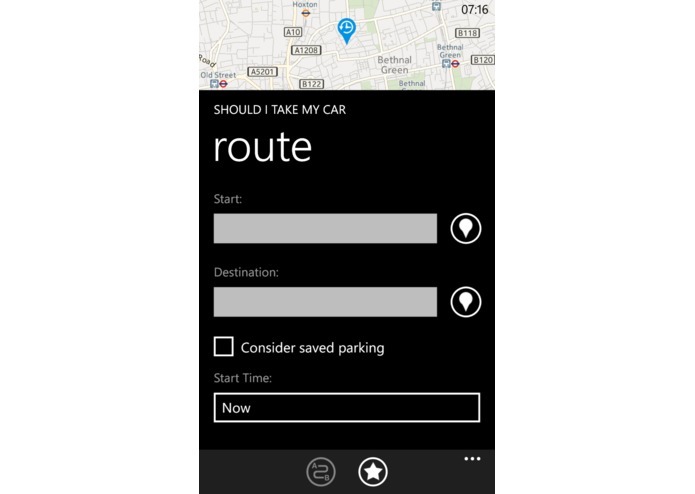 "Should I Take My Car" is a mobile application which can help reduce congestion in London and assist commuters by advising them on whether they should use the car or other means of transport to reach their destination. 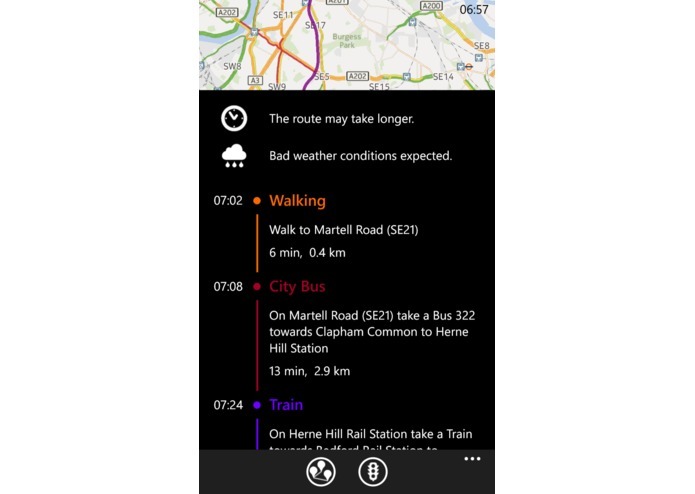 The application uses a wide range of data such as weather information and forecast, traffic jams, road works, TFL public transport schedules in order to generate a list of best routes, taking into account car, bicycle, walking and public transport in London. 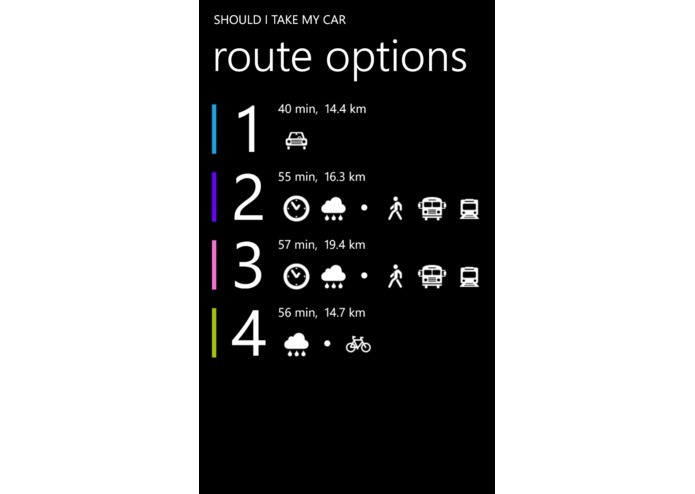 Compared to the other apps already on the market “Should I Take My Car” provides you with the best way to get to your final destination not only considering all means of transport and unexpected circumstances (such as weather conditions), which might affect your journey, but also the your car’s data. 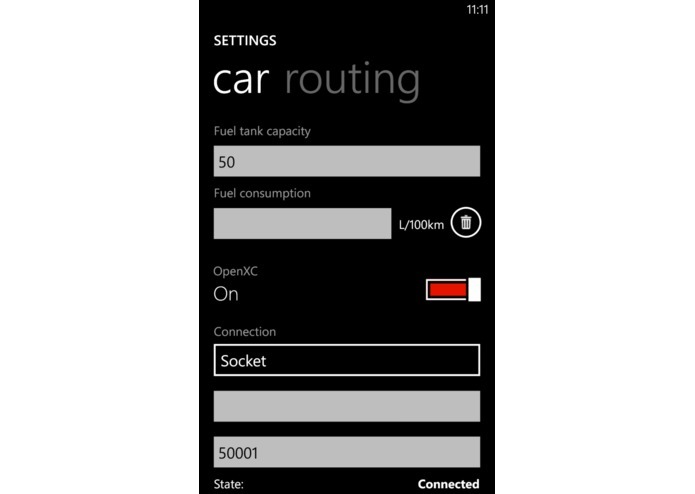 Fuel consumption and level are provided thanks to OpenXC protocol ported to Windows Phone platform used by the application, which then automatically adapts the user driving route accordingly. By recommending the fastest and most effective route with various means of transportation, the application helps commuters to spend less time for travelling and reliefs the city from unnecessary congestions. In fact, car routes will not be recommended in case of poor traffic conditions. Lastly, the application provides satellite tracking function, which guides the user along his/her selected route in real time avoiding the potential user need to switch to another application. The user-friendly and intuitive UI of the application guarantees a pleasant and smooth user experience, easy to repeat on a daily basis.